With a range of materials to choose from when deciding on your driveway, including block paving and gravel, why should you opt for asphalt instead? With asphalt you can enjoy the visual effect of a real stone or brick driveway, but with additional benefits that aren’t seen with the above mentioned materials. There are a number of benefits that you can take from asphalt driveways. 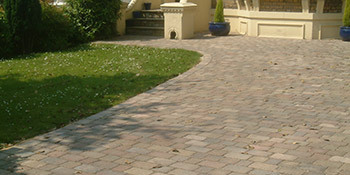 The cost of renovating your home’s front garden could have put you off a driveway in the past. Gravel or paved driveways can prove expensive, but with asphalt you could save thousands of pounds on the installation cost. The durability of asphalt driveways is another significant reason to invest. When installed by a professional the surface won’t crack or lift. It’s also resistant to water, ensuring the driveway structure isn’t affected. And on top of this plant growth and insect activity is eliminated. With an asphalt driveway you have the opportunity to create something unique, and there are a variety of patterns and colours available to choose from. With no raised or broken pieces it will bring huge aesthetic value to your home and this can be maintained for years with minimal maintenance required. Asphalt driveways provide a number of benefits for all homes, with an aesthetic appeal that can’t be matched by gravel of block paving surfaces. If you’re interested in an asphalt driveway for your home, complete our quick form and receive up to four FREE quotes from local, vetted and reputable professionals. Project: Tarmac driveway with bricks whole around. Project: Customer visited the mydrivewayprices.co.uk site and submitted an enquiry. Property type: Terrace, Property owner: Owner, Work description: Level and tarmac front garden for parking. Very efficient. Phoned same evening and came to house following day and provided quote. Really polite and gave a great overview of the works required. Good Salesman came across well. Looks to be providing a great service and the Salesman had a really good manor. Very nice and not pushy. very nice not push and accepted his quote. The problem was mine, when I filled in the questionair, I was confused and marked down as I though what I had in my garden and it should have been the revers, but the people who came understood and it was no problem for them. You found and contacted the appropriate firms, quickly. Quotatis was helpful to recommend few companies, but sorry to say PAVEWISE HOME IMPROVEMENT company I used did not do proper job, as promised. I would not get anything again from this Company.. Very poor and unsatisfactory job done by them..
Homes are given an energy score based on exactly how efficient they are and ratings are shown in the data underneath. This ranges from A, by far the most energy efficient, to G, the very least efficient. With a higher rating you're more likely to have less expensive energy bills as more heat shall be kept in your home. It is possible to boost your home's efficiency with insulation such as double glazing, loft lagging or wall cavity insulation. There are numerous types of property in Britain and the data below shows the type of homes within Uk. Throughout the country the most popular property types tend to be semi-detached and terraced housing, but detached homes, flats and bungalows are also available. The data underneath gives an indication for the number of homes in Uk that are central heated and non-central heated. Households are heated by a variety of sources which indicate how expensive yearly energy bills will likely be. Examples of central heating include gas, electricity, oil, solid fuel and LPG boilers. Changing exactly how your house is heated can easily see you with cheaper bills. The information underneath displays the spread of homes heated up by different fuels. Throughout the UK the most common by far and away are gas heated houses, followed by electricity and then oil. Biomass central heating boilers are also rising in popularity, heated by environmentally friendly products such as wood pellets or agricultural waste.|Properties in Britain are heated by a number of fuels, including gas, electricity, oil, solid fuel and LPG boilers. Each fuel has a varying cost associated with it which means you may find yourself with less expensive energy bills by switching how your household is heated. Even solar thermal panels are being considered by many as a way to reduce heating bills for the many years to come.